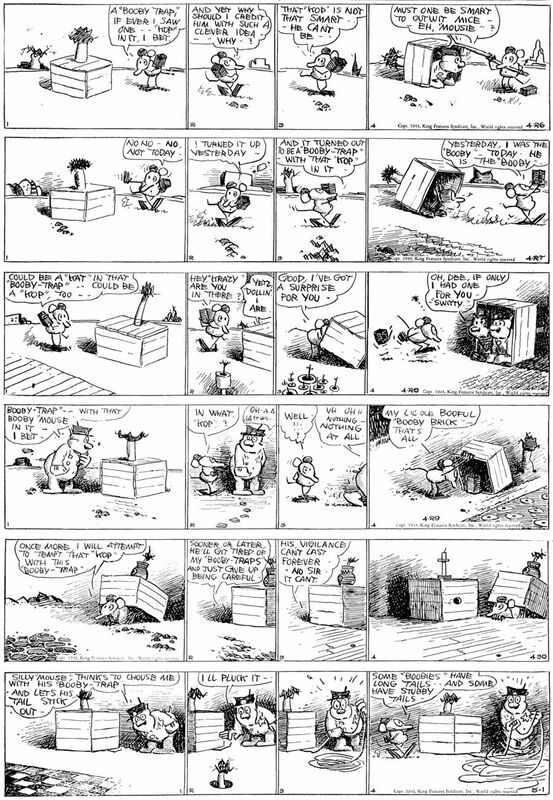 Dudley Fisher’s art is up to it’s usual standard in the Myrtle strips from 1-17 to 1-23-1949. The Sunday page is a lot of fun, showing the whole family listening to a mystery program on the radio together, just before television started to muscle in. No DVRs either, or an interruption from friends wouldn’t have been such a big deal. Krazy is from 4-26 to 5-1-1943, and once again the World War encroaches on the story line. This time it’s booby traps, I especially like the 5-1 as Offissa Pupp unwinds about 70 yards of fake mouse tail from under the box. Felix is still time-travelling in the stone age in the 4-16, and being envious of Danny Dooit’s celebrity in the 4-17 through 4-22s. I love the way Otto draws the dinosaurs in the 4-16, sort of like Winsor McCay, but less of a feeling of bone structure and simpler shapes. The cave man reminds me of Elzie Segar’s drawings, and the greeting card made of stone is a harbinger of the Fleischer Stone Age cartoons of 1940. I haven’t updated the old Catblog in several months, but who cares? I have no readers, and never hear from any of you. Of course, Itza and I would LOVE to hear from you at kausler@att.net, but I’m sure you’re too busy to write. My screening at the Union hall back in May was not too well attended, about 26 people showed up. In June I did a show and animation workshop in Ojai. I made the bonehead play of all time when I packed up all the film equipment and cables for the show, but forgot the FILMS! A friend loaned me a bunch of his 16mm prints, which we ran instead, and it was just as well as we drew a massive audience of ONE, a very nice lady named Dorothy. So as they said in the old Hal Roach comedy “A Lad and A Lamp”, “the small time’s not so hot anymore”. Not even the kids care about cartoons anymore, at the Union hall the only child in attendance spent most of the show in a corner punching his iphone. You are currently browsing the Mark Kausler's CatBlog blog archives for July, 2017.